It’s common for women to experience symptoms of postpartum depression, anxiety and OCD all at once. It can be hard to tell if you have them if you’re not aware of all of the symptoms. So many women experience them and don’t realize that they are separate conditions and not simply a symptom of postpartum depression. If you’ve ever wondered exactly what those feel like, Jordan does an excellent job explaining what it felt like to her. *This is a guest post and all opinions are those of the author and not necessarily those of www.runningintriangles.com. Due to the nature of the topic, this post may contain graphic details that some may find disturbing. All that I have ever wanted in life is to be a mom. Growing up my parents always viewed going to the doctor as a joke, something you really only need to do if you are on your death bed. They also viewed mental illness as a made up weakness. So therefore this was my view as well, until it happened to me. One of the best times of my life. It wasn’t perfect. I did have morning sickness. My legs endlessly ached, back hurt, and I developed hemorrhoids but besides that I felt on top of the world. Everything I did such as cleaning felt so good like I had super powers because I could complete all these tasks while carrying and creating a human. Family events that I would have normally be freaking out to go to were fun, entertaining I actually looked forward to going! I never made an official birthing plan I just wanted to go with the flow, do what I felt like in the moment since I had no idea of what to expect. I ended up having an emergency cesarean as the baby couldn’t get passed my pelvic bone. From the second they cut me open and removed my baby cleaned him off and stitched me up they immediately asked me if I wanted to hold him, I thought they were crazy! It’s like “um ya, I can’t even feel my arms I am so freaking exhausted so no I don’t want to hold him.” I could barely even look at him, I just wanted to rest. When I was wheeled out of the operation room I was lying on a movable bed in a small room with computers and two nurses just waiting for an actual room. They made me breast feed and all I wanted to do was get in my own room and rest. But that never really happened. I was so nervous about my baby that I hardly slept at all plus with all the nurses endlessly coming in, and my newborn expressing his needs, sleep just wasn’t even an option. I was so sleep deprived, and because of the surgery I couldn’t even get out of bed for 24 hours to comfort my own baby. My husband or the nurse would have to hand him to me. Breast feeding was a consistent continuous battle. I remember just crying silently every night I was in the hospital just so tired and so many emotions overwhelming my every thought. My husband would ask me want I wanted to eat for each meal and I was just so not into it. I didn’t want to eat. I was tired. Worried. Nervous. When my mom brought me my favorite meal I finally really ate and I mean over-ate and I thought I was feeling better. But after learning my baby had severe jaundice and having to watching him sleep in a machine wasn’t exactly comforting. By the fourth day all I wanted to do was freaking leave and go home! After finally being cleared to leave my husband and I had one last task, watching a video about not shaking your baby. Which seems so dumb, so obvious but it is a serious issue. I remember watching it and just laughing hysterically, to the point of tears. I felt like a complete psychopath. We couldn’t go home because of the condition of the roads so we had to stay a few nights at my parents which I am actually extremely grateful for as my mom was amazing and let me sleep at night while she stayed up with my baby. A few days later we could safely travel back home where it only continued to get worse. Breastfeeding was going to be the death of me. I felt like a human cow. Every 45 minutes, I kid-you-not, I had to feed my baby. They need to eat every hour and a half and since feeding him alone took 45 minutes that only left 45 minutes in between. It felt like a living nightmare for somebody who is normally constantly in motion… Not only that but when we took our baby into the doctors a week later they just kept telling me he was losing weight. I would take him a week later to be informed he was still losing weight. A week later, same story. It was so frustrating with how often I was feeding him and how much time it consumed that he wasn’t adequately gaining weight. Every time I wasn’t feeding him I would be trying to pump so I could at least sleep 4 hours a night while my husband fed him a bottle. But whenever I pumped I just wasn’t seeing a constant supply. I went to a lactation nurse, tried drinking the teas, and taking the pills but after only a month and a half of completely suffering I had, had enough. I told my husband that I couldn’t do this any longer and we needed to give him formula. Life started to get a tiny bit better after that, or so I thought. When my baby was about 3 months old I was giving him a bath one day and I turned and knocked a shampoo bottle off the bath tub ledge and it happened to fall right on the side of his head. He started crying and I felt so terrible as that spot was very soft, still developing. I felt so mortified about the accident. Two weeks later I noticed a sizable bump growing where I thought the shampoo bottle had hit him. At his four month check up the bump was still present and continuing to grow, my mom went with me to his appointment to make sure he was okay. The pediatrician said she thinks he has a infantile hemogioma and that the shampoo bottle hitting him had nothing to do with it. About 4% of babies are born with hemogiomas and the cause is unknown, the bump will eventually disappear on its own but to be sure we had several tests done. He had x-rays, ultrasounds, and went to Children’s hospital around his six month birthday. During the appointment our pediatrician was kind of hinting around asking me about postpartum depression, but with my mom accompanying me I chose to ignore her, this is when I first heard about this illness. This was a very terrifying experience to go through as I thought it was all my fault and the doctor’s must be wrong. I convinced myself he would die from this and spent hours a day googling alternative diagnoses. I even thought I wanted it to be something more serious, like a tumor, anything he could possible die from. But after going to Children’s and confirming he would be just fine, I felt a wave of relief from what seemed like a terrible nightmare. The self blame however, was always there. Months of sitting at home was driving me mad. I missed work. I missed talking to adults. I felt so irritable every single day of doing the exact same things and the exact same routines. Even though it was always exciting to see my baby develop and learn new things I was suffering inside. I lashed out on my husband constantly. I resented my baby. I would ignore his cries just looking to do anything else but nurture him. Folding, scrubbing, vacuuming but each cry felt like a nail being hammered to the back of my skull, and I would think who ignores their own child? And I developed this sickness that would fester in my mind telling me I was a terrible mother and I constantly wondered why couldn’t I love every second of everyday as a mom. Why wasn’t I enjoying every moment? I was convinced I must be twisted. I would have images constantly flash in my mind of my baby drowning while I gave him a bath. I would imagine he suffocated and I would walk in his room every morning and find him dead. At night when I would wake suddenly and didn’t hear a cry I would think he was dead and instead of immediately getting up to check on him I would just lie there thinking what good will checking on him do if he really is dead? Maybe I wished he was? During the day I would burst out in tears or have this overwhelming pain of sadness where I just couldn’t even look at my baby or husband and he would notice it. Sometimes I would walk into my bedroom just lay on the bed and stare at every imperfection I could see analyzing it. Like “oh look at that mark on the wall it is so dirty everything is dirty I need to get up and wipe that off,” but I just wouldn’t even move. I still had weeks left of maternity leave but I was so miserable I asked my doctor if she could sign my release form at my month and a half check up. I begged my husband to let me go back to work, but I did wait until my maternity leave was up. Going back to work helped but it did not heal me. I would dread leaving work everyday. I didn’t want to go back home. Home felt like a place that basically needed to be quarantined at all times. Whenever I sat down my legs would physically start aching I constantly felt restless. I spent 80% of my time not at work cleaning. Cleaning used to be something that would be a stress reliever to me. It was therapeutic. It was fun. It made me feel good. But it turned into the complete opposite. Cleaning or even thinking about cleaning would become so stressful to me that I would almost never even want to get started. I had so many imaginary rules placed in my head. I needed to clean the entire house in one day. I believed if I didn’t the contaminates from one room would get into another. Everything had to be done in a specific order, from one end of the house to the other. You couldn’t step on any floor that had been cleaned in fear of the dirt and dust from the unclean floor contaminating the clean one. After cleaning the kitchen I never wanted to use it again as it would all become imperfect and I would have to start from scratch. It would take several days for me to allow anyone to even make anything in the kitchen. We could only use one bathroom as the other bathroom was the guest one and was only be used by guest or bathing the baby. Then after the whole process was complete which would usually take 8-10 hours in one day I would obsess over everything staying clean. Whenever we came home from work clothes would immediately have to be changed in fear the outside air would get on my furniture and I would have to re-clean it. If someone wore their shoes in the house I would start panicking and scrub every single inch where they walked after they left. When we ate any meal I would vacuum off our chairs as I didn’t want any crumbs to get on the floor. I vacuumed almost the entire house every day. Every time I left the house with Lucas when we came back home I would wash and clean his entire diaper bag or anything else that may have touched a dirty floor or table. These are just a few examples of what it was like. All of these tasks and the pressure of completing them all became so overwhelming I was unable to function at times, because the thing I turned to to relieve my stress was now actually creating it. I felt so overwhelmed I would constantly think of all the things I needed to be doing but often couldn’t find any motivation at the same time, that I saw no way out. I thought about suicide multiple times. I would even plan it out it my mind. These thoughts were terrifying as I never intended to follow through with them and it was completely unwanted. I began to turn to self harm. I would feel so overwhelmed I would go into the bathroom to freak out and cry alone, and while I was in there I would cut myself with a box knife. Just a small, not very deep, cut just to try and relax. Unfortunately it wasn’t really relaxing and only helped for a minute or two until I convinced myself to just sleep it off. I was cutting myself like a emo teenager, something I would have never done as an actual teenager. And every time my arm scarred I would think to myself 10 years from now when I’m wearing a tee shirt and my child is in school I will be looking down at my arm and think he did this to me. Who has thoughts like that?! About someone so innocent! I started to not be able to sleep in my bed. When I had to get up in the middle of the night to feed my baby I often just slept on the couch anyway but I started to not even bother sleeping in my room at all. I felt like I didn’t deserve to sleep in there. I was a terrible wife, a terrible mother who doesn’t deserve to sleep next to her husband. I should sleep out here where it’s dirty since I’m dirty anyway and my husband needs to get his rest and this way I can hear the baby as he is closer to me, are the thoughts I often had. The blade briefly rests on the start point on the forearm. And pressing down ever so slightly counting one….two… and release. Tiny pockets of blood begin to form and then collide together to make one stream running down wrapping around the front of the arm reaching the hand making patterns over the skin. The color dark at the start point ends so much brighter and richer. If there are too many cuts the smell of rusting iron protrudes, a sign that helps pull back the mind which is wondering off into a sickening feeling of relief. A chorus echoes in the distance, the world seems bright again, you can feel your heart physically beat but it all ends too soon when the cries begin crushing through the monitor like being shaken awake from the deepest part of sleep…. I finally talked to my friend about some of the things I was going through instead of my husband or family. She told me I needed to get help immediately. I didn’t want to though. I didn’t want to believe it even though I knew it. I have always feared doctors and going to the doctors office, I just couldn’t bring myself to get help so she called and made an appointment for me. Unfortunately I didn’t already have a general doctor so I had to wait another month and a half to get help. During this time of waiting I had one of my worst mental breakdowns on my birthday. I will never forget the thoughts going through my mind as I sat on the bathroom floor and cried and then later in my closet. It was complete hell. I finally got help when my baby was 8 months old. I started taking an anti- depressant. Two weeks into taking this medication I wasn’t feeling any better. My husband and I went on an anniversary but on the drive back home I had a terrible anxiety attack. It was brought on because of having to pick up my baby that night instead of the next day as I just wanted to go home and pick things up before having to bring him home but those plans got ruined. I thought I was never going to calm down. A few weeks later I had another appointment to follow up and also see a psychiatrist. Which I was completely terrified and against, but my doctor insisted. I told my doctor I think my anxiety is the thing causing my depression so she switched me to a different anti-depressant. I went to see the psychiatrist afterwards and it was one of the worst experiences I have ever had. My anxiety was through the roof. 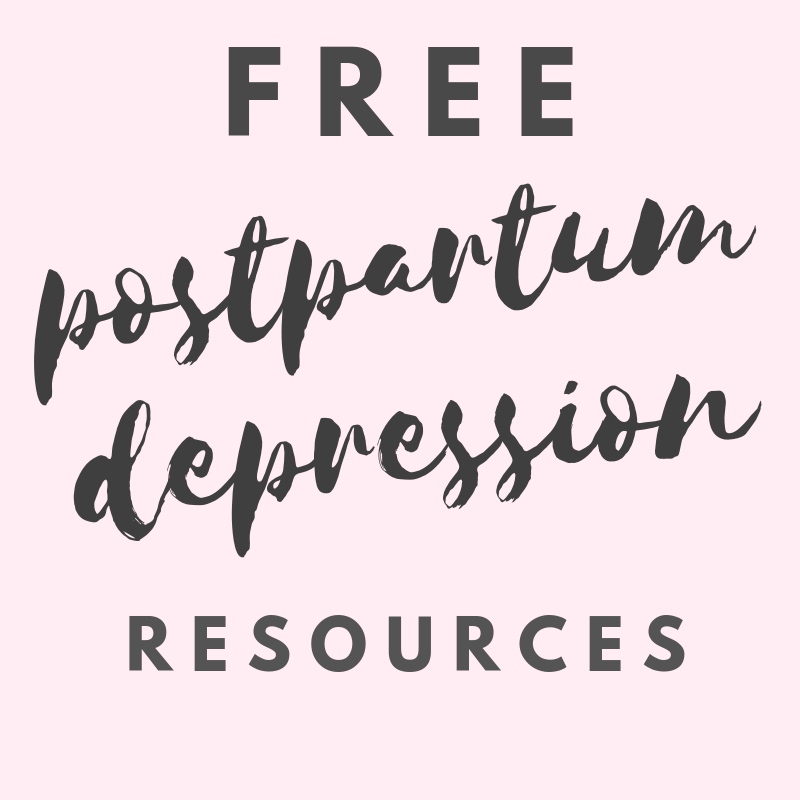 I was diagnosed with postpartum depression, anxiety (GAD), and OCD. After taking the new medication for a month I demanded to be switched yet again as this medication made me feel so lazy, unmotivated, and zombie-like I was becoming super depressed that I could never get anything done. The third anti-depressant I was put on was did nothing for me. I noticed all OCD tendencies. Extreme irritability, although I did feel more active. At last I switched to the anti-depressant that worked best for me. I was about ready to just completely give up hope as I had been dying to find relief and it had taken three months to do so. It took two weeks to actually work as the first two weeks, anxiety and OCD were subsiding, but depression was worsening. I finally was feeling a little relief only to find out we were losing our current childcare and I would have to stay at home with Lucas all day again. This terrified me. What if I spiraled downward again as I no longer have anything to focus on but being at home and watching him. My dosage was raised, and I continued to notice I still had severe depression for a week at a time and then for a week be a little better and then back to depression and I would lose so much energy, constantly fatigued and feeling the need to sleep for at least 12 hours a night. Because I didn’t feel the need to constantly be cleaning anymore I filled that void with wasting so much time becoming a hypochondriac. I would Google for at least two hours daily diseases I was definitely dying from. I would read and re-read article after article on symptoms I was sure I had from Addison disease to Lupus I thought I had some underlining death sentence I was determined to uncover. When chores start to pile up and I finally get enough energy to complete the process of cleaning the entire house I found it as one of the only times I would feel more satisfied. However anytime I felt I didn’t have enough time to do this, I would resort to cutting to help with all the overwhelming feelings. I continue to have these struggles daily. As life goes on and my son gets older month by month I only hope this experience becomes more and more of a distant past and I continue to enjoy what I can of his infanticy. Even though I have gone through this intolerable journey it does not stop me from wanting more children. Do I fear what will happen next time, yes. But what out-weighs the “what if’s” and uncertainties is ironically my sweet, energetic, loving, strong, adventurous, handsome, 14 month old little baby boy and his longing for a playmate. Mental illness is real. Postpartum mental illnesses need to be better understood and recognized and if my story helps just one struggling mom out there I know I have made a small difference to someone. If you have a postpartum depression story to share, Running in Triangles wants to help. Click Here.